For nearly 70 years, he was the youngest person ever to reach that target until his record was finally broken in the year 2007 by current player Alex Rodriguez. 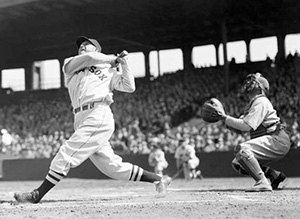 After 10 years of batting for the Athletics, Foxx Joined the Boston Red Sox in 1936. He stayed with the Red Sox for about eight years following which he had a two-year career with the Chicago Cubs in 1942 and 1944. When he retired he was representing the Philadelphia Phillies in 1945. 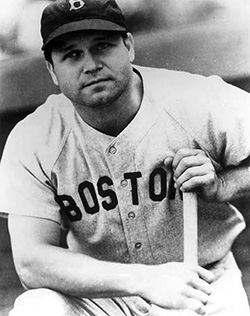 Jimmie Foxx had earned a number of titles to his name during the two decade span of his professional league career. He was awarded the Most Valuable Player award twice in a row in 1932 and 1933, and won it again in 1938. He had taken his team to winning two World Series Championships in the years 1929 and 1930. Three years after his second World Series titles, Foxx and the Philadelphia Athletics went on to win the Triple Crown Championship. In the year 1951, Double X was inducted to the Baseball Hall of Fame, with a proud 534 home runs and almost two thousand runs batted in. His batting average through his career was .325, and he had over 2500 hits. 23 September, 1945 saw the last appearance of this baseball star where he wore the uniform of the Philadelphia Phillies. After he retired from professional baseball, Foxx became a coach and manager for a minor league baseball team. He was the manager for the All American Girls Professional Baseball League and for the Fort Wayne Daisies during his post career era. Jimmie was excellent in his game, but found that business was not his forte. A number of bad investments left him broke 10 years before his unfortunate demise in 1967. It so happened that Jimmie's second wife, Dorothy, choked on food and died a year before Foxx's death. Incidentally, Foxx died the same way, choking on food. Flagler Memorial Park, Miami, hold the grave of the baseball legend. Though he has been gone for a good number of years, he made a remarkable statement in the field of baseball, showing his prowess at fielding, pitching and batting. Power hitters are plenty; however, there are only a handful of players are like Foxx, who can strike complete and utter fear into the hearts of their foes. Much respected during his time, a city baseball field was named after him in Lakewood, Ohio, where he retired.